STYLEBOOZE: "So I have this friend..."
"So I have this friend..."
Social Media is here and now. It's how you know "of-the-moment" information and who's doing what at any given time. Between Facebook, Twitter, and Linked-In, it's safe to say we are always connected. How many people have been "friend requested" by a friend of a friend? You may never have even formally met them, but because you see a common friendship you accept. You've heard of them, heard your friend talk about them, seen their photos, but never actually met them. What if you have things in common with this person? What if they could be your next big industry contact? Or boyfriend or girlfriend? You might never know if it wasn't for the newest breakout star in social media called 3Degrees. Brian Scordato is an entrepreneur from New York. After attending Business School at UNC Chapel Hill, he saw that there was a need for people to have a more direct method of networking on both personal and professional levels. He spoke to friends and colleagues living in all different cities, and found that a common issue they all had was not being able to meet new people in a comfortable way. Whether they wanted a new job or to join a sports league, they weren't sure where to look first. But Brian did, and 3Degrees was born. I sat down with Brian to really understand how this new website works, and how a simple idea came to life. JJ: WHERE DID THE INITIAL IDEA FOR 3DEGREES COME FROM? BS:A friend of mine from college had moved to a new city after graduating and immediately met a guy she started dating. They were together for a few years, but eventually the relationship ended. She picked her head up and realized she hadn’t really met anyone since moving years before. She tried a few online dating sites, but had some bad experiences. She found that lots of people misrepresented themselves, and while there are definitely good people on these sites, she found there were enough bad ones that it wasn’t worthwhile. This made me think about how most people I knew met. It was either through natural channels, like school or work, or through mutual friends. I tried to think of a way to incorporate the trust element present when a friend introduces you to their friend. I wanted 3Degrees to mimic this mutual friend introduction. I thought about the bond and the level of social proof a mutual friend brings to any interaction, and figured there had to be a way to leverage our years of social networking to let people meet their friends’ friends in a more efficient matter. JJ: WITH SO MANY UP AND COMING SOCIAL NETWORKING SITES OUT THERE, WHAT MAKES 3DEGREES UNIQUE? BS: Facebook, LinkedIn, Google+, Path, etc. all do a great job of letting you keep track, and interact, with the friends and connections you already have. I love these social networks, and use them constantly. However, there’s one gaping hole in all of these networks; They don’t help you meet new people. We all enjoy meeting new people, whether it’s friendly, romantic, or professional in nature. The majority of these relationships stem from an introduction by a mutual friend. These introductions happen rarely, and often by circumstance. If you happen to be at a party with a friend and their friend, you may get introduced. Every once in a while a friend goes out of their way to make an introduction. There’s no good way to seek out these connections, we need to wait and hope they happen out of serendipity. I built 3Degrees to leverage Facebook, and eventually other social networks, to help you meet NEW friends, instead of organizing and interacting with old friends. 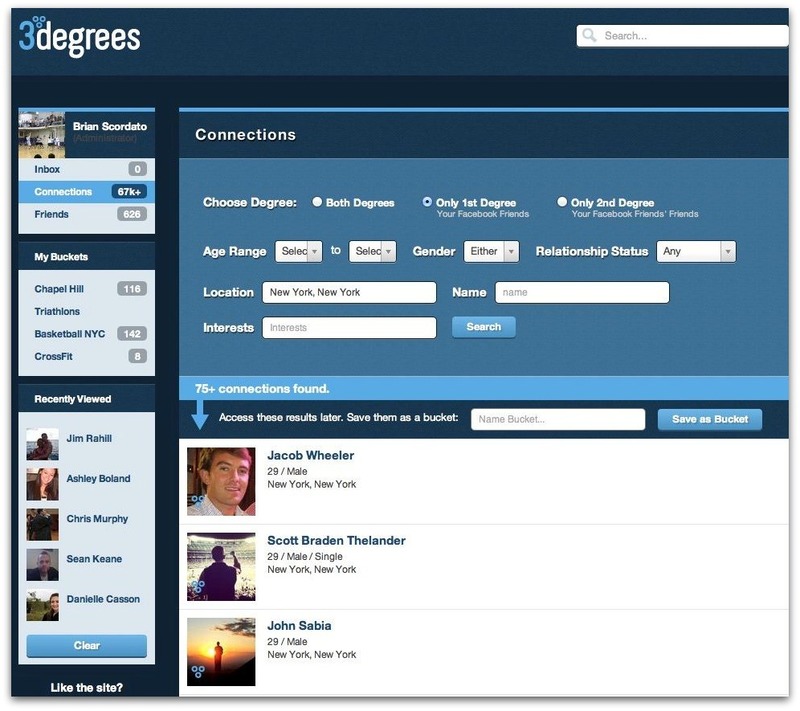 JJ: FACEBOOK ALSO ALLOWS YOU TO SEE PEOPLE’S “FRIENDS OF FRIENDS,” SO HOW DOES 3DEGREES DIFFER IN THIS REGARD? BS: Facebook lets you see friends of friends in a long list on one user's profile. You’re only able to see the friends of one of your friends at a time, and there’s no way to sort. If your friend has 800 friends, you would need to click through each one to find out anyone interesting. You’d then need to look through EACH of your 800 friends’ friends, which is obviously impossible. We dump all your friends’ friends into a pool that you can easily sort through to find interesting people. Facebook provides all the information, but we make it possible to digest, and use, this information. JJ: NETWORKING IS OBVIOUSLY AN INTEGRAL PART OF BEING IN THE WORKPLACE; DO YOU THINK 3DEGREES IS MORE HELPFUL IN CONNECTING PEOPLE AS OPPOSED TO A SITE LIKE LINKED-IN, WHICH SPECIALIZES IN PROFESSIONAL CONNECTIONS? BS: I think LinkedIn is good for certain parts of networking. You can see detailed professional profiles of friends, connections, or people in your search results. However, using 3Degrees brings a unique, and very important, element. For a lot of people in our generation, LI networks and FB networks are different. I know I’m not connected to most of my closest friends via LI, as I already know what they’re doing professionally. On the other side, I’ve got LI connections that I met at a conference once and would never feel comfortable reaching out to for an introduction on facebook. Networking through friends is more effective. I want a friend who knows my personality giving my resume to another friend of theirs. This is better than a contact I worked with on one project 4 years ago passing my resume along. JJ: BEING THAT THE SITE IS VERY NEW, DO YOU PLAN TO ADD OTHER FEATURES TO FURTHER EXTEND THE ABILITY OF 3DEGREES TO CONNECT PEOPLE? BS: Yep, we've really just scratched the surface with functionality. We are going to add in Activities soon, which will allow people to meet through searching their connections (the way we have now), as well as through specific activities posted in their network. A quick example: If someone wanted to go rock climbing, but didn’t have any friends who rock climbed, they could post an event to go to a certain rock climbing gym. Any friends or friends of friends in the area with “rock climbing” in their interests would get notified, and they could RSVP. Eventually, vendors will be able to post events – so a rock climbing gym could post a 15% discount for a group of 6, and people in the same network could attend and get a discount. It’ll hopefully be an interesting way to meet people with similar interests who you share a network with. JJ: HOW “PRIVATE” IS MY PRIVACY ON THE SITE? BS: All of your privacy settings from Facebook carry over. If you allow everyone to see your photos on Facebook, then everyone will see them on 3Degrees. If you have a private profile, it’ll carry over as well. Additionally, the only people who can see your 3Degrees profile are either your Facebook friends, or their friends. Everyone who sees your profile, and every profile you see, is at most 1 introduction by a mutual friend away. JJ: DO YOU HAVE TO HAVE EXACT WORD MATCHES IN ORDER TO FIND CONNECTIONS IN THE SEARCH? FOR EXAMPLE, IF I HAVE “FASHION” ON MY PROFILE AS AN INTEREST (WHICH I DO BY THE WAY!) WILL PEOPLE WHO ONLY HAVE “FASHION” SHOW UP? OR WILL PEOPLE HAVING “SHOPPING” “STYLE” AND/OR RELATED INTERESTS SHOW UP AS WELL? BS: As of now, it’ll be exact. We are working on grouping terms though. All interests will eventually have a “parent” interest – so basketball, football, baseball will all fall under “Athletics.” As people search, we will start to group them as well, so eventually when you search “Fashion” you will get all sorts of related search love. JJ: CAN YOU PLEASE EXPLAIN WHAT THE “BUCKET” IS? BS: Sure. A bucket is basically a saved search. The best way to explain is through an example. If someone had just moved to San Diego and they were looking for people to play basketball with, they could search “basketball,” “San Diego,” and any other characteristics they were interested in. Lets say they had 4 results. They could save this search as a bucket called “Basketball Players.” Now, every time a Facebook friend of theirs joins 3Degrees, any of THEIR friends who meet the search criteria of the bucket will filter in. So as more of your friends start using 3Degrees, your buckets should grow. Another great application of this is for members looking for single people. You can create search criteria for what you’re looking for in a boyfriend or girlfriend, and then as your friends join 3Degrees, their single friends will filter in. You can search through easily, and ask for an introduction. JJ: I KNOW YOU ARE BIG INTO BASKETBALL, SO IF YOU WANTED TO FIND A BASKETBALL LEAGUE IN NEW YORK CITY, IS IT AS SIMPLE AS TYPING “BASKETBALL LEAGUE” INTO THE SEARCH? OR WOULD SOMEONE ELSE HAVE TO OF POSTED THAT IN ORDER FOR YOU TO FIND IT? BS: I sure am big into basketball. Part of the reason I made this site is so I would always have someone to play with. We aren’t quite to the “Basketball League” search yet. Your best bet would be to search for people who listed basketball as an interest. However, when we add our activities functionality (within the next 6-8 weeks), it will be as simple as typing “Basketball League” and picking a league to play in. JJ: THIS SITE REALLY GIVES PEOPLE THE OPPORUNITY TO REACH OUT IN ALL AREAS OF LIFE (BOTH PERSONAL AND PROFESSIONAL), WHERE DO YOU SEE IT GOING IN THE NEXT FEW YEARS? BS: That’s the million-dollar question, and to be honest, I don’t know. I built the site knowing that I wouldn't know where it’s going. My hope was to create a platform our members could use as a “jumping off” point, and then I’d change the focus as it became clear what people used 3Degrees for. I can’t really tell yet. I hope it becomes a site that drives people into the real world. I wanted our members to hop on, find people who are interesting, then get out in the real world and do stuff with them. I don’t want this to be a Facebook-type site, where you spend half your life clicking through updates. That’s great and I do it all the time too, but I wanted to make a site that helped people accomplish goals and made them happier – whether means finding a basketball league, a yoga group, a software developer or a boyfriend. I think people's happiness is directly correlated to the activities they do, and the people they do them with. Hopefully our site can improve both. Well guys, I don't see how you would need any further convincing. A site that is trying to better your well-being by giving you a personal and professional network to reach out to sounds like a no-brainer to me. I've already signed up and you should too! 3Degrees Video from 3Degrees on Vimeo. CHECK OUT 3DEGREES ON FACEBOOK!